After I had finished all the frantic birthday sewing I felt my sewing mojo ebbing away a little and I felt utterly utterly uninspired by my stash. Enter Tessuti and their gridlock fabric. 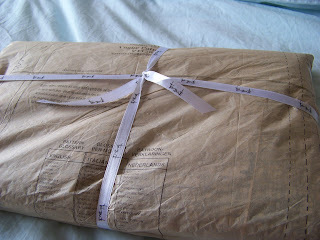 In the meantime the fabric has popped up on several blogs around the world. Karen from Did You Make That made a jacket out of it and I think Sew Brunswick is making a dress. There is a competition attached to the fabric, but to be honest, my sewing skills are not up to this sort of playing, so I picked it mainly to check out Tessuti without paying 30 odd dollars per meter. I want to make a dress out of it, but because it has quite a bit of polyester in it (at least I assume that poly is short for polyester, showing my general ignorance here), it needs to be fully lined. I made a bodice muslin for both New Look 6935 View A and Butterick B5181 View A.
I do like the fabric very much, good luck with your pattern hunt. Do you already have lots to choose from? 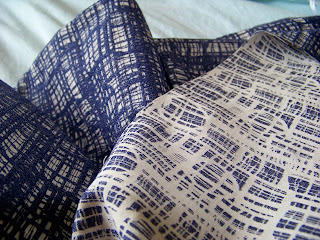 This fabric is very cool indeed! Can't wait to see what you make!